I hope it is permissible to blow my own horn on my own blog. Two concepts recently received official blessing after a good long while, for one of which I'm responsible, and for the other of which I'm partly responsible. The mysteries are revealed below the fold. 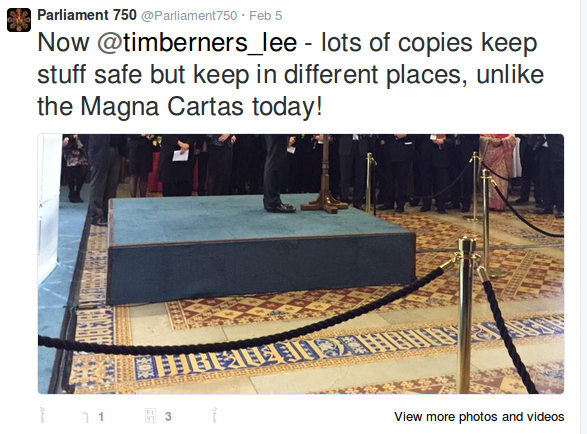 On Thursday 5 February 2015, the four surviving original copies of Magna Carta were displayed in the Houses of Parliament – bringing together the documents that established the principle of the rule of law in the place where law is made in the UK today. I invented the acronym LOCKSS more than a decade and a half ago. 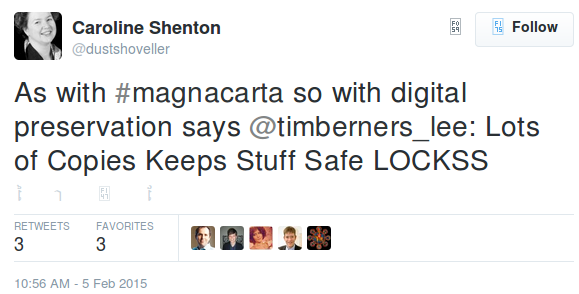 Thank you, Sir Tim! On October 24, 2014 Linus Torvalds added overlayfs to release 3.18 of the Linux kernel. Various Linux distributions have implemented various versions of overlayfs for some time, but now it is an official part of Linux. Overlayfs is a simplified implementation of union mounts, which allow a set of file systems to be superimposed on a single mount point. 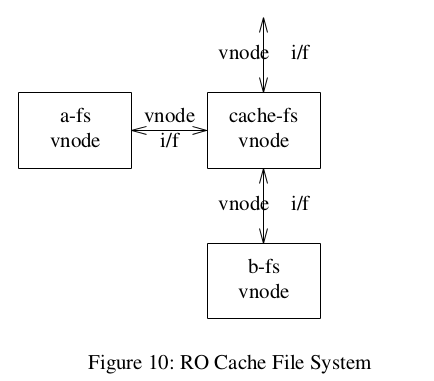 This is useful in many ways, for example to make a read-only file system such as a CD-ROM appear to be writable by mounting a read-write file system "on top" of it. This use of stackable vnodes was in part inspired by work at Sun two years earlier on the Translucent File Service, a user-level NFS service by David Hendricks that implemented a restricted version of union mounts. All I did was prototype the concept, and like many of my prototypes it served mainly to discover that the problem was harder than I initially thought. It took others another five years to deploy it in SunOS and BSD. Because they weren't hamstrung by legacy code and semantics by far the most elegant and sophisticated implementation was around the same time by Rob Pike and the Plan 9 team. Instead of being a bolt-on addition, union mounting was fundamental to the way Plan 9 worked. About five years later Erez Zadok at Stony Brook led the FiST project, a major development of stackable file systems including two successive major releases of unionfs, a unioning file system for Linux. About the same time I tried to use OpenBSD's implementation of union mounts early in the boot sequence to construct the root directory by mounting a RAM file system over a read-only root file system on a CD, but gave up on encountering deadlocks. The consensus at the 2009 Linux file systems workshop was that stackable file systems are conceptually elegant, but difficult or impossible to implement in a maintainable manner with the current VFS structure. My own experience writing a stacked file system (an in-kernel chunkfs prototype) leads me to agree with these criticisms. Note that my original paper was only incidentally about union mounts, it was a critique of the then-current VFS structure, and a suggestion that stackable vnodes might be a better way to go. It was such a seductive suggestion that it took nearly two decades to refute it! My apologies for pointing down a blind alley. Overlayfs allows one, usually read-write, directory tree to be overlaid onto another, read-only directory tree. All modifications go to the upper, writable layer. But given the architectural issues doing one thing really well has a lot to recommend itself over doing many things fairly well. This is, after all, the use case from my paper. It took a quarter of a century, but the idea has finally been accepted. And, even though I had to build a custom 3.18 kernel to do so, I am using it on a Raspberry Pi serving as part of the CLOCKSS Archive. Thank you, Linus! And everyone else who worked on the idea during all that time! David Hendricks, The Translucent File Service, pp. 87-93, Proceedings of the Autumn 1988 EUUG Conference, Vienna, Austria, October 1988. David S. H. Rosenthal, Evolving the Vnode Interface, Proceedings of the Summer 1990 USENIX Conference, Anaheim, 1990. Rob Pike, Dave Presotto, Sean Dorward, Bob Flandrena, Ken Thompson, Howard Trickey & Phil Winterbottom, Plan 9 from Bell Labs, Computing Systems Vol. 8, No. 3, Summer 1995. Jan-Simon Pendry & Marshall Kirk McKusick, Union Mounts in 4.4BSD-Lite. Proceedings of the USENIX Technical Conference on UNIX and Advanced Computing Systems: pp. 25–33 December 1995. David S. H. Rosenthal, A Digital Preservation Network Appliance Based on OpenBSD, BSDCon, 2003. Charles P. Wright, Jay Dave, Puja Gupta, Harikesavan Krishnan, Erez Zadok, and Mohammad Nayyer Zubair, Versatility and Unix Semantics in a Fan-Out Unification File System, Stony Brook University Technical Report FSL-04-01b, November 2004. Valerie Aurora, Union file systems: Implementations, part I. lwn.net, March 2009. Valeria Aurora, Unioning file systems: Implementations, part 2. lwn.net April 2009. Miklos Szeredi, overlay filesystem, October 2014. Kirk McKusick's fascinating FAST15 keynote A Brief History of the BSD Fast File System corrects my memory. BSD acquired stacking vnodes in 1987, according to Kirk after discussions with me. I think Steve Kleiman was responsible for much of the content of those discussions. For sure, Kirk's implementation of stacking in BSD was much cleaner than my prototype in SunOS.